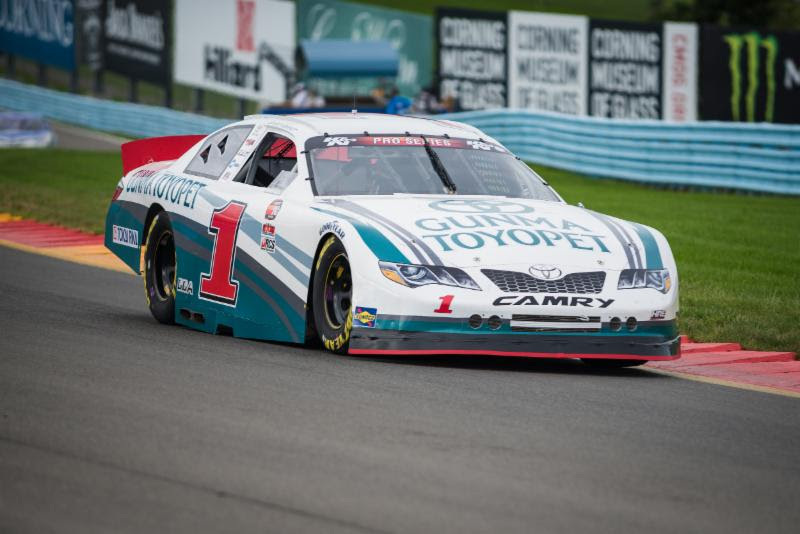 Brett Moffitt earned his first-career road course victory at Watkins Glen International (WGI) after a furious dash through the field over the final nine laps in Friday’s Great Outdoors RV 100. Moffitt powered his No. 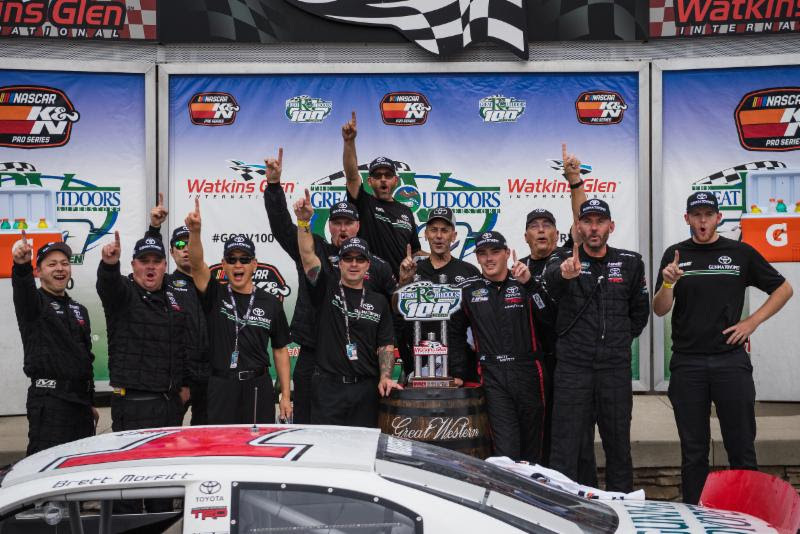 1 Gunma Toyopet Toyota Camry to his 10th-career victory in the NASCAR K&N Pro Series East (NKNPSE) and his first victory on the tour since 2013. 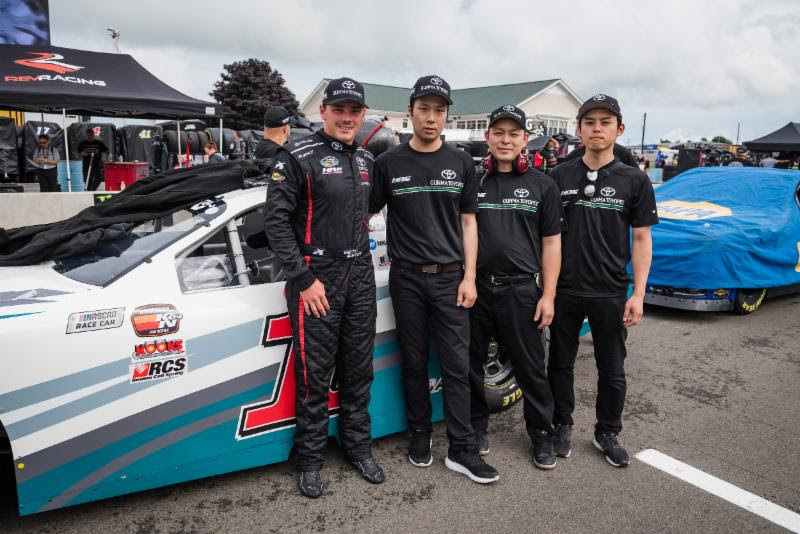 The effort to compete at “The Glen” was to prepare Moffitt and his team for the NASCAR Camping World Truck Series (NCWTS) playoff opener on the road course at Canadian Tire Motorsports Park later this month, and they passed with flying colors. 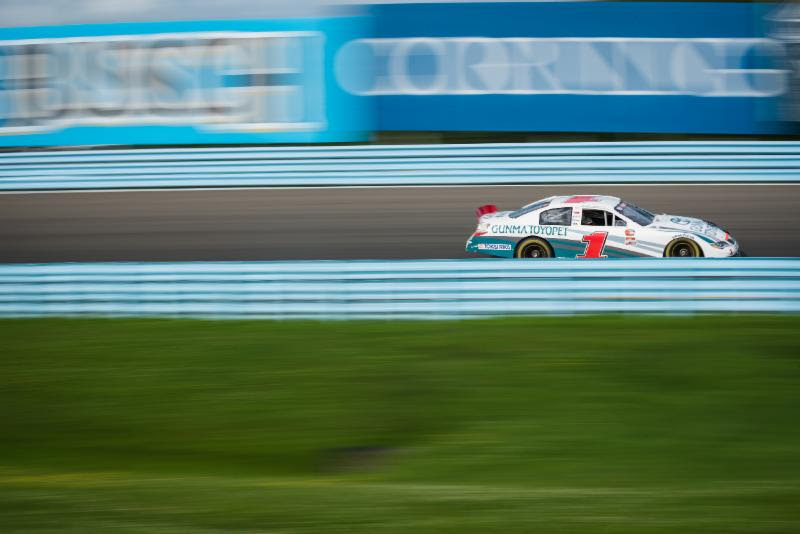 As WGI was soaked with a consistent rain throughout the morning, Moffitt posted the fastest lap in the practice session, but started from 21st after qualifying was scratched due to weather conditions. The green flag flew under clearing skies and over a mostly dry race track. Moffitt disposed of 10 cars on the first lap and moved to 11th on the first lap. After cracking the top 10 in less than three laps, contact form another car spun Moffitt in turn 1 and relegated him to 16th. Moffitt pitted for repairs under a lap five caution and restarted 21st on lap eight. By the competition caution on lap 16, Moffitt had sliced his way to sixth and pitted for four tires, courtesy of HRE’s guest mechanics from Gunma Toyopet. An aggressive restart on lap 19 earned Moffitt the second spot and took the race lead on lap 23. 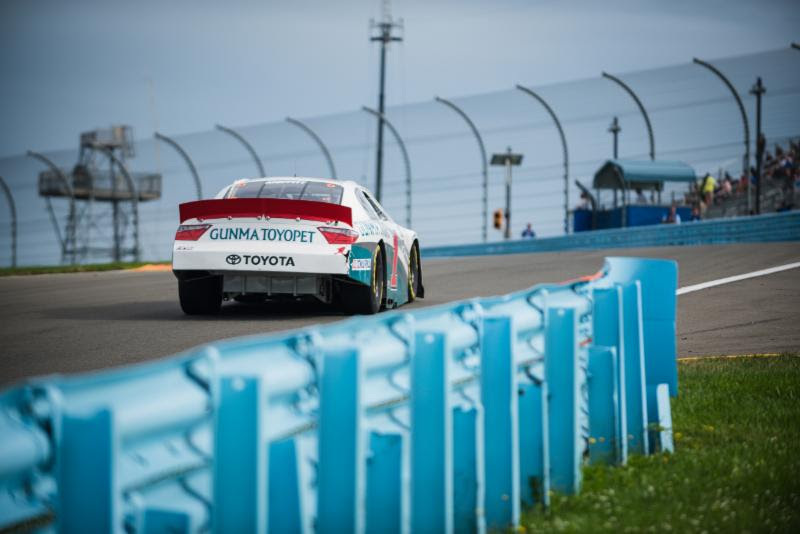 However, grass on the racetrack clogged the grille on Moffitt’s Camry and skyrocketed the temperatures to force Moffitt to pit road under green. He returned to the track in 16th, and had advanced to 12th once the caution flew on lap 29. When the race restarted on lap 33, Moffitt unleashed an unrelenting assault on the top 10 and slashed his way to the front. Moffitt wasted no time and was fifth on lap 36 and moved to second on lap 38. Coming to the white flag, Moffitt made a move to the inside of the No. 7 car for the race win after erasing a nearly three second deficit and completed the race-winning pass in turn 1 on the final lap. 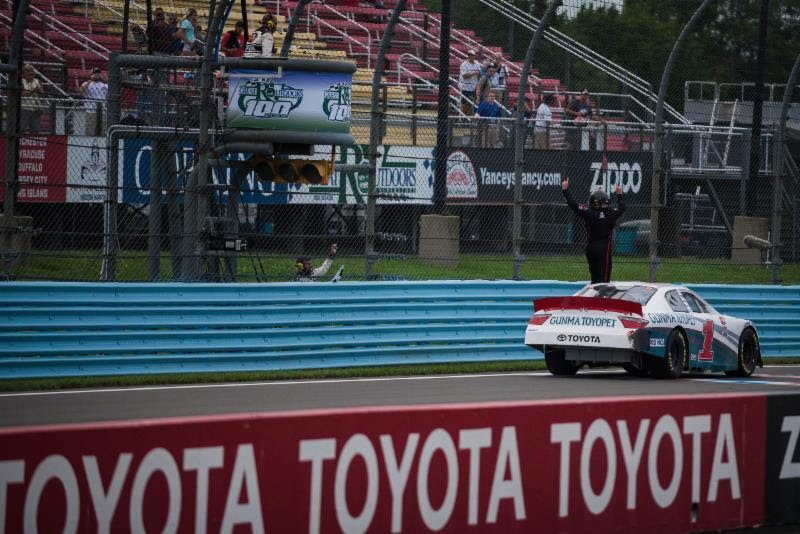 Moffitt came back to the checkered flag to post his first-career win at WGI, his fourth total victory in 2018, and the third NKNPSE win for HRE team owner Shige Hattori. "It was certainly eventful. We spun early, got our left-front fender ripped off early. It was really unfortunate because our Camry was really good. I was kinda down after that and then once we got back up to the lead we got grass on the front grille and had to pit under green. Then, I really thought our day was over but everything just worked back out." "It certainly would have been way more difficult (if the No. 7 hadn't slipped at turn 11). I saw him coming into the last two turns, he got a loose into both of them and that really allowed me to close the door in a hurry." Gunma Toyopet Motor Co. has founded by Syunsaku Oyama in 1956 and it is the dealership company based in Maebashi city, Gunma prefecture. Its company principles are based on “customer first” and “cherish the harmony among people” to meet their customers' satisfaction. It operates 20 new car dealerships, 5 used cars retail shops, 1 Lexus dealer, 4 shops specialized in trade-in used cars, as well as automotive parts and car supplies. Gunma Toyopet also has been affiliated with Gunma Victory Works Co.
Hattori Racing Enterprises (HRE) was founded in 2008 by Shigeaki Hattori and since then the team has fielded entries in a variety of different series, including the NASCAR XFINITY Series, NASCAR Camping World Truck Series, NASCAR K&N Pro Series, and ARCA. As a former driver, Hattori captured the Japan Formula Toyota championship in 1994 and moved to the United States the following year to race open-wheel cars. He competed in the Toyota Atlantic Series, Indy Lights and IndyCar. He won a pair of Indy Lights races in 1998 and made two starts in the Indianapolis 500. In 2005, Hattori made the transition to stock cars and drove a Toyota in the NASCAR Camping World Truck Series before moving into team ownership. HRE's race shop is located in Mooresville, N.C.